In a newly published study, Duke University researchers detail how they electronically linked the brains of rats for the first time, allowing them to communicate directly to solve behavioral puzzles. Durham, North Carolina — Researchers have electronically linked the brains of pairs of rats for the first time, enabling them to communicate directly to solve simple behavioral puzzles. A further test of this work successfully linked the brains of two animals thousands of miles apart—one in Durham, North Carolina, and one in Natal, Brazil. The results of these projects suggest the future potential for linking multiple brains to form what the research team is calling an “organic computer,” which could allow sharing of motor and sensory information among groups of animals. The study was published February 28, 2013, in the journal Scientific Reports. To test this hypothesis, the researchers first trained pairs of rats to solve a simple problem: to press the correct lever when an indicator light above the lever switched on, which rewarded the rats with a sip of water. They next connected the two animals’ brains via arrays of microelectrodes inserted into the area of the cortex that processes motor information. One of the two rodents was designated as the “encoder” animal. This animal received a visual cue that showed it which lever to press in exchange for a water reward. Once this “encoder” rat pressed the right lever, a sample of its brain activity that coded its behavioral decision was translated into a pattern of electrical stimulation that was delivered directly into the brain of the second rat, known as the “decoder” animal. The decoder rat had the same types of levers in its chamber, but it did not receive any visual cue indicating which lever it should press to obtain a reward. Therefore, to press the correct lever and receive the reward it craved, the decoder rat would have to rely on the cue transmitted from the encoder via the brain-to-brain interface. The researchers then conducted trials to determine how well the decoder animal could decipher the brain input from the encoder rat to choose the correct lever. The decoder rat ultimately achieved a maximum success rate of about 70 percent, only slightly below the possible maximum success rate of 78 percent that the researchers had theorized was achievable based on success rates of sending signals directly to the decoder rat’s brain. Importantly, the communication provided by this brain-to-brain interface was two-way. For instance, the encoder rat did not receive a full reward if the decoder rat made a wrong choice. The result of this peculiar contingency, said Nicolelis, led to the establishment of a “behavioral collaboration” between the pair of rats. In a second set of experiments, the researchers trained pairs of rats to distinguish between a narrow or wide opening using their whiskers. If the opening was narrow, they were taught to nose-poke a water port on the left side of the chamber to receive a reward; for a wide opening, they had to poke a port on the right side. The researchers then divided the rats into encoders and decoders. The decoders were trained to associate stimulation pulses with the left reward poke as the correct choice, and an absence of pulses with the right reward poke as correct. During trials in which the encoder detected the opening width and transmitted the choice to the decoder, the decoder had a success rate of about 65 percent, significantly above chance. To test the transmission limits of the brain-to-brain communication, the researchers placed an encoder rat in Brazil, at the Edmond and Lily Safra International Institute of Neuroscience of Natal (ELS-IINN), and transmitted its brain signals over the Internet to a decoder rat in Durham, N.C. They found that the two rats could still work together on the tactile discrimination task. “But in this case, we are not inputting instructions, but rather only a signal that represents a decision made by the encoder, which is transmitted to the decoder’s brain which has to figure out how to solve the puzzle. So, we are creating a single central nervous system made up of two rat brains,” said Nicolelis. He pointed out that, in theory, such a system is not limited to a pair of brains, but instead could include a network of brains, or “brain-net.” Researchers at Duke and at the ELS-IINN are now working on experiments to link multiple animals cooperatively to solve more complex behavioral tasks. “We cannot predict what kinds of emergent properties would appear when animals begin interacting as part of a brain-net. In theory, you could imagine that a combination of brains could provide solutions that individual brains cannot achieve by themselves,” continued Nicolelis. Such a connection might even mean that one animal would incorporate another’s sense of “self,” he said. Such complex experiments will be enabled by the laboratory’s ability to record brain signals from almost 2,000 brain cells at once. The researchers hope to record the electrical activity produced simultaneously by 10-30,000 cortical neurons in the next five years. Such massive brain recordings will enable more precise control of motor neuroprostheses—such as those being developed by the Walk Again Project—to restore motor control to paralyzed people, Nicolelis said. The Walk Again Project recently received a $20 million grant from FINEP, a Brazilian research funding agency, to allow the development of the first brain-controlled whole-body exoskeleton aimed at restoring mobility in severely paralyzed patients. A first demonstration of this technology is scheduled for the opening game of the 2014 Soccer World Cup in Brazil. In addition to Nicolelis and Pais-Vieira, other co-authors of the Scientific Reports study were Mikhail Lebedev and Jing Wang of Duke, and Carolina Kunicki of the Edmond and Lily Safra International Institute for Neuroscience of Natal, in Natal, Brazil. The research was supported by the National Institutes of Health (R01DE011451), including NIH’s National Institute of Mental Health (DP1MH099903); the Bial Foundation; the Brazilian Program for National Institutes of Science and Technology; the Brazilian National Council for Scientific and Technological Development; and the Brazilian research funding agencies FINEP and FAPERN. 2 Comments on "Electronically Linked Brains of Rats Communicate Directly to Solve Behavioral Puzzles"
This article reminds me of telepathy. 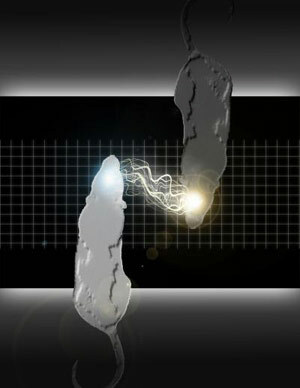 When two brains are linked electronically they mediate with each other. This I have experienced even as a school boy by playing OUIJA board on the teacher’s table after the class was over. Myself and my friend would write a OUIJA board on chalk piece on the teachers table and use a carrom striker as a common medium. One will not disclose his thoughts or questions to the other. Both will concentrate on the striker by touching gently and it will start moving haphazardly first and then will give clear answers to the questions of the one (which is not disclosed to the other). There seems to be a brain wave synchronization of the two people’s thoughts. However, I will not vouch for the predictions to be true always. Since, I am a science man to the core, I don’t consider any metaphysical miracle in it but I am convinced that both the brains are in a combined communication. The answers will be to the extent of the knowledge database of the two people only. Thank You. We are the Borg. Resistance is futile!